This is a movie that came out on DVD last year (weird), sometime towards the end of June. I had heard a bit of buzz about it coming out of the major indy film fests, but I never really got bit by the bug to check it out. 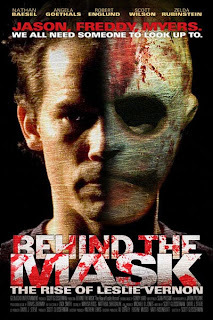 Behind the Mask: The Rise of Leslie Vernon basically fell off my radar as quickly as it showed up. Quick jump to early December and I'm sitting at home in a darkened living room, begging my lady to make some popcorn, as the previews come up on the Hatchet DVD. If you'll indulge me for a moment I'll explain that my sheer excitement over Hatchet and my deep desire to see it in a theater setting led me to sit through all the previews stuck in front the the feature film. This is something I never ever do. But I'm glad I did as it reintroduced me to the messed up world of Leslie Vernon. The movie's basic premise is that Leslie Vernon has been training his entire life to become the next big horror/slasher icon and a film crew is documenting his rise to infamy. The first half of the movie takes place as a mockumentary, think Spinal Tap but with more murder. The film crew covers everything from Leslie's extensive physical training, to discussing house exit strategies, and even the inevitable mass homicide in the film's final act. There's a lot of sly audience winking, but never in that heavy handed Scream sort of way. The movie simply oozes charm. Nathan Baesal does a comendable job as the titular Leslie Vernon. During the mockumentary he delivers a great, fun performance. Leslie Vernon is your average twenty-something simply trying to make his mark on the world. You genuinely come to like Leslie and his behind the scenes, on-camera antics. Just when you feel like this guy could be your best friend, he breaks out a serious, nasty comment or action, reminding you just who this guy really is. And that is who Leslie Vernon really is, a human monster with some seriously creepy, clown-like vibes coming from that mask. In the second half of the film the mockumentary facade fades away and we get down to the slasher essentials. Although this is the weakest part of the movie, that's not really a complaint. The more traditional slasher portion of the film is well done, and as it happens, necessary for the film's success. The mockumentary is fun, but it needs to lead somewhere, and the last half of the film is that much required pay off. This is one of those films that didn't get a lot of mainstream coverage and I'd hate for it to slip through the cracks. Even if you're only a casual friend of the genre, I'd recommend checking this one out. Doubly so because this is one of the few slasher films in recent memory that the lady sat down to watch without any additional goading on my part. Nathan Baesal is charasmatic as hell and really draws you into the world of the movie. By the time the slasher movie really begins, you're so comfortable with the characters that you almost forget what you're in store for. Bottomline: The film is fun but still manages to scare, and the girlfriend loved it. What more can you ask for in a horror flick? P.S. I didn't mention this anywhere because it just didn't naturally fit, but the film also co-stars Robert Englund and even features a brief cameo by Kane Hodder. Rock! I agree... a great movie! 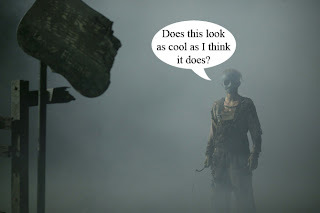 What do you think about the possibilities for a sequel? I will not see this movie. Come on. . .Leslie? I mean, if my name was Leslie, I guess I'd be a killer too, but even so, no movie killer can be named Leslie. Now, for the real reason I'm saying anything. Hellboy 2 trailer is out. I don't know how I feel about it. Your thoughts, oh excellent one? Leslie. . .I mean, seriously! To be honest the Leslie thing may be part of the reason this movie originally fell off my radar. Having seen the movie, I realize the name choice is appropriate given the tone of the film, which is comedic. I'm fairly sure the film makers wanted you to say, "Leslie? Laaaaame." It's all part of the joke. I should probably also mention (spoiler) that the guy's name isn't actually Leslie Vernon. Take it for what you will. As for a sequel, if you stayed through the credits I don't think I'm spoiling anything to say the door is wide open. And although I enjoyed my brief stay in Leslie's world, I'm not sure what they would accomplish with a sequel. This film was meant to be a commentary on a sub-genre more than anything else. I don't think the mockumentary style would work in a sequel, thereby eliminating some of the charm immediatly. So, overall, feelings are mixed. I'd probably watch it though. As for Hellboy II- it looks great. Definitely bigger and hopefully better than the first. I have hope that it's not just flash over substance as the director, Guillermo del Toro, knows how to appropriately up the ante in a film of this type. Need proof? I submit to evidence exhibit A; Blade 2. Either way, the movie is sure to be fun.